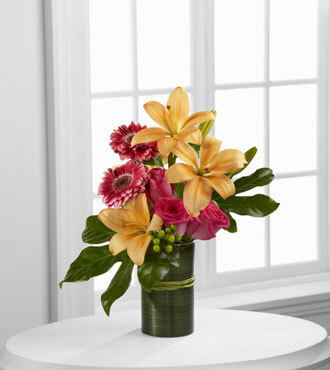 The FTD® Sweetness & Light™ Arrangement is a gorgeous gift set to celebrate any of life's special moments. Hot pink roses and gerbera daisies are bright and beautiful arranged amongst peach Asiatic lilies, green hypericum berries and stunning Fatsia leaves. Presented in a clear glass vase wrapped in a ti green leaf material accented with raffia ribbon, this bouquet blooms with a sweet sophistication to delight your special recipient. GREAT bouquet includes 7 stems. Approx. 17"H x 16"W. GREATER bouquet includes 10 stems. Approx. 19"H x 16"W. GREATEST bouquet includes 13 stems. Approx. 21"H x 16"W.